The OPT-HP comes with a special waterproof connector on a two-foot underwater cable. Longer cables are available as options. The hydrophone is powered from the audio jack inside the housing. The anodized aluminum camera mount comes is a special shipping box. 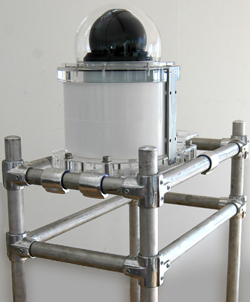 It is designed for use with our OceanCam PTZ cameras and will work with similar AquariCam models. The mounting base is generally supplied with 24" legs that can be secured to the bottom or inserted into slightly larger diameter pipes. The top base with the camera attached is removable. Anti-tampering screws with a special tool is supplied for securing the top camera base. Custom designs are also available. OPT-JS Joystick gives responsive and accurate control of all PTZ underwater cameras. The unit is constructed with durable materials and have a professional look and finish. The units are designed for both left hand and right hand use. It has a 3-axis joystick with a turn knob and six application defined hotkeys. The units are easy to install with USB interface. Power over Ethernet (PoE) greatly simplifies the deployment of IP cameras, wireless access points, and other equipment whose location is critical for performance. However, cable lengths in Ethernet networks are limited to 100 metres (328 ft), which is a serious restriction in many installations. Our Ethernet Extender overcomes this limitation by simply connecting one unit inline with an underwater network cable that instantly boosts its range from 100 to 200 metres (656 ft).